About four-in-ten Americans say they support the Occupy Wall Street movement (39%), while nearly as many (35%) say they oppose the movement launched last month in New York’s financial district. By contrast, more say they oppose the Tea Party movement than support it (44% vs. 32%), according to the latest survey by the Pew Research Center for the People & the Press and The Washington Post, conducted Oct. 20-23 among 1,009 adults. One-in-ten (10%) say they support both, while 14% say they oppose both. Partisanship plays a strong role in attitudes about the two movements. About six-in-ten Republicans (63%) say they support the Tea Party. That jumps to 77% among Republicans who describe themselves as conservative. Just 13% of Democrats support the Tea Party movement, while 64% are opposed. 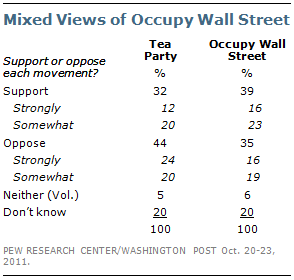 About half of Democrats (52%) – and 62% of liberal Democrats – say they support the Occupy Wall Street movement. Among Republicans, 19% say they support the anti-Wall Street protests, while more than half (55%) oppose them. 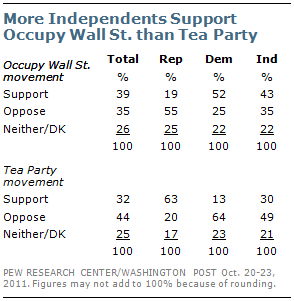 Independents have mixed opinions of the Occupy Wall Street movement: 43% support the movement and 35% are opposed. By contrast, the balance of opinion among independents toward the Tea Party is much more negative: Just 30% support the Tea Party movement while 49% are opposed. Those following news about the Occupy Wall Street protests closely also tend to be more supportive than those following less closely. Six-in-ten (60%) among those who followed news about the protests very closely last week say they support the movement; 31% say they oppose it. Support drops to 33% among those who say they have not followed this news too closely – and just 12% among those who say they have followed this news not at all closely.